Though the Indian Army did not give much operational details of the retributive assault across the Line of Control against Pakistan Army positions in Nowshera sector of Jammu and Kashmir which were “aiding” infiltration, sources in the force said the strike was carried out on May 9, nine days after two Indian security personnel were beheaded. “A recent action by our troops in the Nowshera sector has caused some damage to the Pak Army posts, which are supporting infiltrations. This is part of our overall strategy to counter terrorism,” Additional Director General of Public Information Maj Gen A K Narula said. The government supported the army’s action, with Defence Minister Arun Jaitley saying it was to ensure peace in Jammu and Kashmir. “Government supports the actions of Indian Army across LoC. Such actions are needed to ensure peace in J&K,” Jaitley tweeted. “Indian Army is taking pre-emptive and measured actions to counter terrorism in valley and disengage Pak posts across LoC supporting infiltration,” he said. 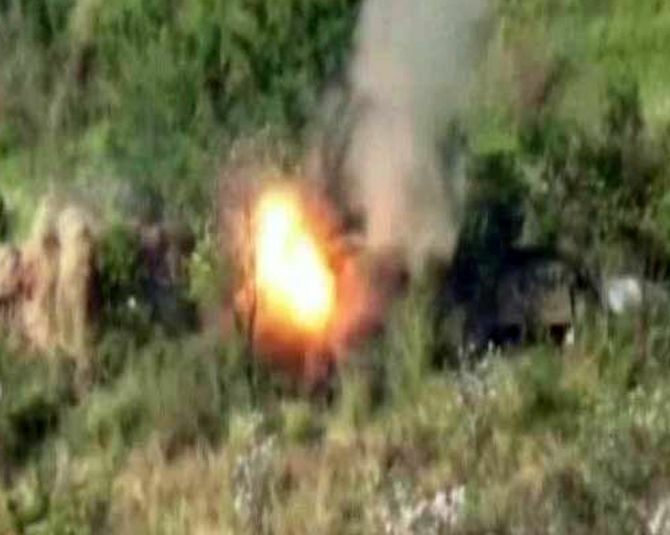 Sources also said the strike was a message to Pakistan that the army will take stronger action with increased frequency against any infiltration attempts from across the border. The 22-second video showed concrete structures being reduced to rubble amid plumes of smoke and balls of fire. However, the area of the operation was not clearly identifiable in the clipping. “As part of our counter-terrorism strategy and to ensure that infiltration is curbed and initiative remains with us, the Indian Army proactively dominates Line of Control. “While doing so, locations aiding infiltration of terrorists are being targeted and destroyed to deny advantage to terrorists thus curbing infiltration attempts,” said Maj Gen Narula. There was no official word on the casualty on the Pakistani side. The army sources said rocket launchers, anti-tank guided missiles and automatic grenade launchers and recoilless guns were used in the strike. He said as part of the army’s counter-terrorism operations, “punitive fire assaults” across line of control are being undertaken. “Pak Army has been providing support to armed infiltrators by engaging our forward troops from their weapon emplacements and pill-boxes closer to the Line of Control. At times they have not even hesitated to target villages in the proximity of Line of Control,” he said. Maj Gen Narula said infiltrations are likely to increase with melting of snow and opening of passes, and referred to the recent incident in Naugam where four terrorists were neutralised on May 20-21. “This calls for even more proactive counter-terrorism operations. “We want peace and tranquillity in the state of J-K. For this purpose, it is essential that the infiltrations along Line of Control are controlled which is essential to bring down the numbers of terrorists in J&K so that youths of J-K are not adversely influenced by terrorists,” he said. Meanwhile, the Pakistan Army dismissed as “false” India’s assertion that it decimated a Pakistan army post. “Indian claims of destroying Pakistani post along LoC in Nowshera sector and firing by Pakistan army on civilians across LoC are false,” Inter-Services Public Relations Director General Major General Asif Ghafoor said in a tweet. maintain peace and tranquility at the border. BSF spokesman said the Commandant-Wing Commander level flat meeting was held at 11.30 am at the request of the Pakistan Rangers. During the meeting, the commanders of the two forces 'discussed various issues including recent unprovoked firing in Arnia Sector and other routine issues related to border management', he said. It was decided to re-energise instant communication between field commanders, whenever required, to resolve the petty matters, he said. "The meeting was held in a cordial, positive and constructive atmosphere and both sides agreed for expeditious implementation of the decisions taken in the earlier meeting and committed to each other to maintain peace and tranquility at International Border," the spokesman said.